As the stock market crash of 1929 plunged the world into turmoil, two men emerged with competing claims on how to restore balance to economies gone awry. John Maynard Keynes, the mercurial Cambridge economist, believed that government had a duty to spend when others would not. He met his opposite in a little-known Austrian economics professor, Freidrich Hayek, who considered attempts to intervene both pointless and potentially dangerous. The battle lines thus drawn, Keynesian economics would dominate for decades and coincide with an era of unprecedented prosperity, but conservative economists and political leaders would eventually embrace and execute Hayek's contrary vision. 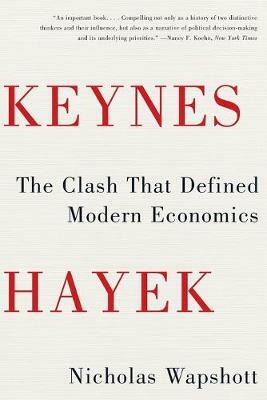 From their first face-to-face encounter to the heated arguments between their ardent disciples, Nicholas Wapshott here unearths the contemporary relevance of Keynes and Hayek, as present-day arguments over the virtues of the free market and government intervention rage with the same ferocity as they did in the 1930s.